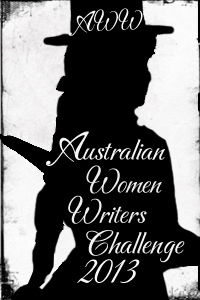 Intrepid investigative journalist Scout Davis has given herself a holiday, but when Hermione Longfellow accosts her in the supermarket, she stops to listen. eccentric Anemone sisters. Always dressed in black, they rarely leave their home nestled in the hills – but Scout is sure that the drinking of chicken blood is just idle gossip. When Hermione asks Scout to track down her sister Nemony’s AWOL husband, believed to have died at sea thirty years ago but recently popped up again on the Great Barrier Reef, Scout jumps at the opportunity. Delightfully witty and addictively fast-paced, this is the second hilarious outing for unforgettable sleuth Scout Davis. 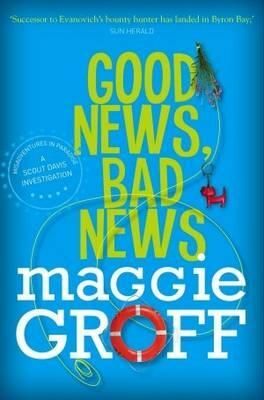 I wasn’t sure whether this title by 2013 Davitt Award winner Maggie Groff (she scooped the Australian Sisters in Crime pool of Best Novel and Best First novel with MAD MEN, BAD GIRLS a few weeks ago) would actually be my cup of tea. It seemed that it would be “lighter” than my usual crime fiction fare. But then I chose it for my face to face reading group to read in the coming month, so in a sense I was committed. I did have my doubts in the first 50 pages or so, but then things settled down a bit, and I must admit to enjoying both the plot and the plotting skill. The blurb on the front cover calls sleuth Scout Davis ” a successor to Evanovich”, and I thought I could detect a bit of Phryne Fisher there too. I also enjoyed the quirky humour – who would call their cat Chairman Meow? – but underneath it all there is some serious, realistic characterisation and some careful plotting. There are a couple of other humour lines such as the guerilla knitting group that I thought were a bit superfluous but I guess they show another dimension of Scout’s character. International readers can find it here on Amazon US for Kindle or audio. The second novel to feature Byron Bay based investigative journalist Scout Davis sees the heroine on the trail of a man thought to have died 30 years previously. She is first contacted by Hermione Longfellow who claims that a man whose photograph appeared in that week’s newspaper was the same Mick O’Leary who had married her sister Nemony in 1983 and was thought to have drowned a few months later while sailing in Sydney Harbour during a freak storm. According to Hermione her sister has been in a deep depression since her husband’s death and she wants Scout to prove that far from being a grieving widow Nemony should be angry about O’Leary’s faked death and potential disappearance with the bulk of her inheritance. The investigative thread of this book speeds along nicely and is full of suspense, especially the final quarter which sees Scout and her friend Daisy on the trail of their prey in Queensland’s gorgeous Whitsunday Islands. In what is something of a rarity for crime fiction without a murder in sight Groff doese a nice job of making the reader care about the Longfellow sisters and the impact of Mick O’Leary’s sudden appearance then disappearance in their lives and it’s not hard to share the characters’ desire to see the bad guy get his comeuppance. The fact that the entire book takes place against a backdrop of some fantastically depicted locations, especially Byron Bay is a bonus. An equal amount of this novel’s space is taken up with Scout’s non-investigative activities which includes a secret life as a yarn bomber, a complicated love-life and a sister, four nephews and a brother-in-law who are in a bit of a pickle. Personally I found this all a bit too chick lit-y for my tastes, especially as every time she appeared we got a detailed description of Scout’s outfits (fashion and I are complete strangers), but I am positive a lot of readers are looking for exactly this kind of combination. Scout’s well-rounded home life offers most of the book’s funnier moments and her family, including her faithful feline companion Chairman Meow, and friends are nicely drawn characters. I do think the book is too long at 360+ pages for what is not a terribly complicated story but the publishing world seems to have universally agreed that bigger is better some time during the last decade and at some point I’m just going to have to accept that I’m the lone voice who still believes that less is more. Overall this is a very readable, very Australian, lighter style crime novel that I’m sure will have a broad appeal.